Into the dark night the call went out: “CQ. CQ. Are there any YL’s on channel? Over.” Way back in the dark days of my early teenage years (well before the Internet) all of my friends used CB (Citizen Band AM 27MHz) radios to talk rubbish with each other at night. The words CQ were used to mean a general call into the radio ether. And of course, YL referred to that most elusive of the human species when one is a young male, for it was the: Young Lady! Of course, my friends and I were either idiots or completely naive (and possibly both!). At the time, it never occurred to us that Young Ladies used the telephone to talk rubbish to each other at night. Who would have thought that happened? As I later found out, a Young Lady would never be caught dead using a CB radio as that was way uncool because of all of those yucky and uncouth young males talking rubbish to one another and taking up all of the airspace. Of course, as a teenager I worked for Tandy Electronics (Radio Shack in the US) and so I had a secret advantage over my friends when it came to CB radio nerddom! Every month when the discontinued items list (and thus the very cheap stuff) turned up at the store I used to scour the list for anything relating to CB radios and then all of my pay went into buying that stuff. And eventually the roof of the tiny little shed in the back garden that I lived in as a young teenager, sprouted all manner of aerials both large and small. 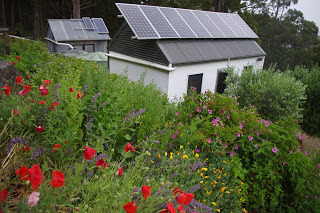 Inside that tiny shed were also numerous power supplies and various CB radios. The holy grail of my CB radios was the SSB (Single Side Band) 12W unit with which I could talk to people hundreds and sometimes thousands of kilometres away! Don’t feel bad for me living in a tiny shed in the backyard! I used to be able to jump the back fence and be off and away down the laneway without waking anyone up. The dog of course had to be paid off in treats just to keep quiet, but me and that dog were tight and watched out for each other. And I won’t even mention the crazy night that I awoke to find my very naughty cat, who lived to a ripe and degenerate old age, urinating on one of the power supplies. The noise and sparks woke me up and I have to add that the naughty old cat never tried that particular trick again! Why am I writing about CB radios, understanding dogs and naughty cats? Well, a few weeks ago I heard an interview on the radio with a very young actor from a television show. I have not watched that television show which is called: Stranger Things. The show is set in the 1980’s and that very young actor was saying that a much older actor in the show who is from my generation (Winona Ryder), had been coaching the much younger actors as to how people used to stay in contact with their friends and also keep themselves entertained prior to smart phones and the internet. 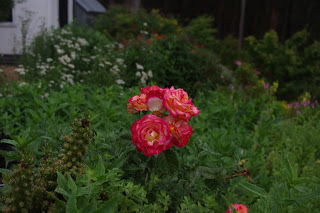 Well, last week, I was rudely plunged into pre-Internet times – Stranger Things indeed! Regular readers will recall that the production of the recent video which I uploaded to YouTube a few weeks ago destroyed my old computer. The old computer died and no amount of coaxing could ever bring that old computer back to life. So, I visited my favourite computer shop and purchased enough new components so as to cobble together a working computer comprising both new and old components. I connected the components together and soon the computer was showing signs of life again. Once the computer was actually working, I was then able to install all of the software which I used to have on the old machine. And to my surprise and horror, all of the software upgrades and downloads (and there weren’t that many) used up all of the remaining internet bandwidth for the remainder of the month (I have a fixed allocation of 15Gb per month). 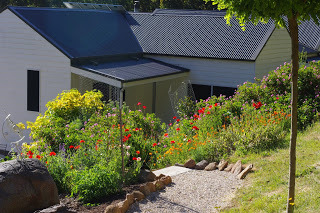 I had only just managed to upload the photos and text for last week’s blog when my Internet Service Provider pulled the pin on the capacity to access the internet here. It was a grim time. 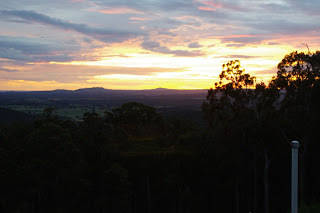 Monday night: Uploaded the blog and just after that the internet access was rudely cut off. Tuesday night: Ate a homemade pizza and watched a pre-recorded episode of Grand Designs UK and then we went for a walk. Wednesday night: The editor and I went to the cinema to watch the very wrong, but oh so enjoyable film: Bad Santa 2. And then we ate gourmet hamburgers in the big smoke. Thursday night: Still no internet, but fortunately the local pub was an excellent diversion and we availed ourselves of quality local brew and chicken parmigiana. Friday night: The internet was back! Friends had invited us to have dinner with them and so instead of using the internet we visited them and there was good food and a lot of laughs. Spare a moment in your day to feel sorry for us, as running on empty and having no access to the internet was a real hardship! However, we are made of tough stuff here at Fernglade Farm and so fortunately we survived the ordeal – only just though! 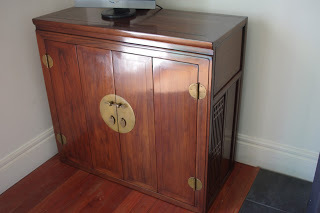 A few weeks back we picked up a second hand Chinese antique style cabinet. The previous owner no longer wanted the cabinet because it was too big for them. We were happy to oblige them and so we took the cabinet. 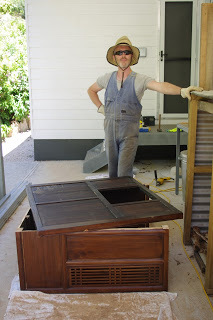 However they were correct that the cabinet was too big and so we decided to Ikea hack it. An Ikea hack means to modify an existing item of furniture in a way that was not intended by the manufacturer. 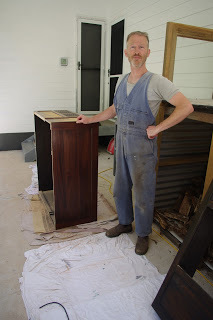 So, we began cutting the cabinet up into smaller pieces. Soon that cabinet was much smaller and of a more reasonable depth. The rear of that cabinet was then prepared to be reconnected with the now smaller front of the cabinet. 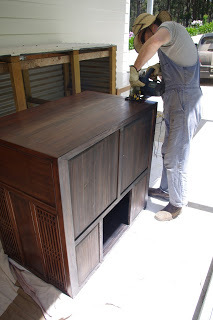 Once the rear of the cabinet was reattached to the front, a generous coating of walnut stain was painted and then polished onto the cabinet. It looked as good as new (as Sir Scruffy can attest in the photo below!) but the cabinet was now smaller and much more usable. We won’t tell the people we got the cabinet from, shall we? In breaking tomato news: Regular readers will be very aware by now just how badly we stuffed up the tomato season. In previous summers, tomatoes have been one of the biggest crops and we usually harvest around 100kg (220 pounds) of the fruit. Not this year though as everything that could have gone wrong, went wrong! 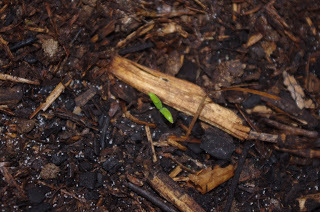 However, earlier in the week when a few tomato seedlings popped their brave heads out of the ground. I started to believe that we would harvest at least some tomatoes this year. I rarely have problems with any pests. 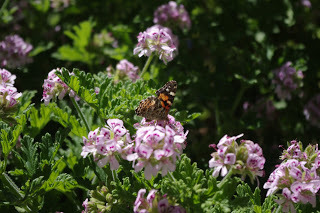 The wildlife runs free through the gardens and orchard. However, the tomato enclosure is not open to the wildlife and I have a serious shortage of frogs in that area. The frogs are active at night and they will happily consume all of those pesky slaters. I have to give serious consideration to this problem over the next year and perhaps adapt the tomato enclosure so that it is more frog friendly than it is at present. 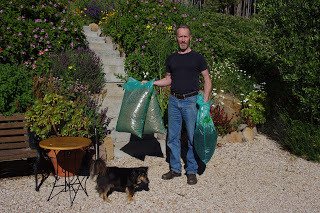 In the meantime, the local nursery provided me with a pesticide which contains the chemical Bifenthrin which is toxic to the slaters, but is also toxic to the frogs. It is a conundrum and is only ever intended as a short term solution to a long term problem. On a brighter note I was able to source many replacement cherry tomato seedlings at a local gardening club and I am very grateful to them. They even threw in a few freebies as they felt sorry for me. 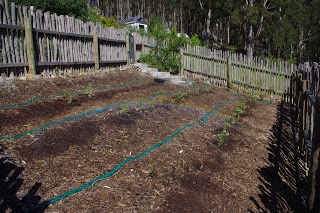 Unlike the tomatoes, you can almost see the potatoes growing! It is also worthwhile noting that the potatoes have not been watered at all this season. 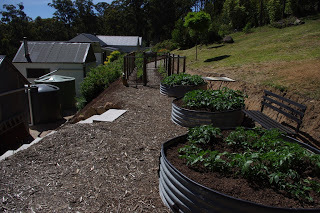 And as they grow, we have been adding more manure to the raised garden beds which buries the lower parts of the plants. Observant readers will also note that in the photo above the rather old and large tree stump on the very right hand side of the photo (which you can no longer see in the photo) has been removed in the past few days and all that remains now is a good quantity of mulch (which you can see in the photo). Out in the garden though, the many elderberry plants look superb! Speaking of sunshine, the warmer days have caused the many tree ferns in the recently planted (May) fern gully to produce many new fronds. The older fronds die back and fall to the ground below the fern. 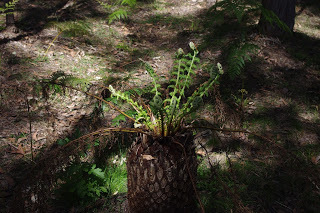 This build-up of organic matter around the trunk of the ferns helps to build the soil. As new fern fronds grow and unfurl, the tree ferns ever so slowly grow in height. Strawberry season is here! Nuff said really. 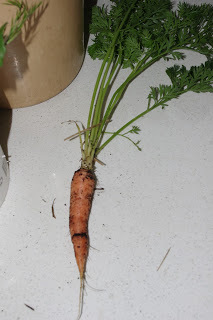 Here is a photo of one spot in the garden where carrots have happily established themselves. 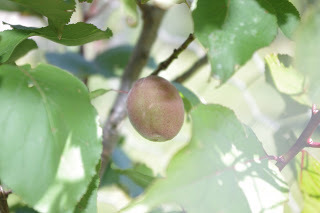 The dozen or so fruit on the many apricot trees here are slowly starting to ripen and should be ready to pick in a couple of weeks. 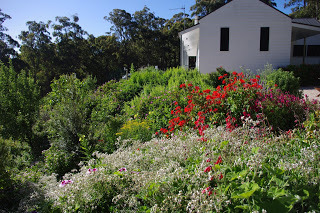 The European and native bees are going absolutely feral in the flower gardens in the warmer conditions. When the sun is shining the buzz is quite loud. 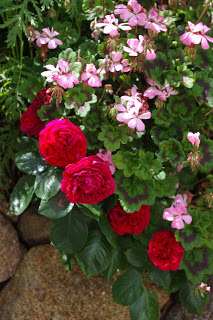 The roses are producing the most beautiful flowers like this hidden but stunning series of red roses. The temperature outside now at about 7.00pm is 18’C (64’F). So far this year there has been 1,142.0mm (45.0 inches) which is the same as last week’s total of 1,140.8mm (44.9 inches). 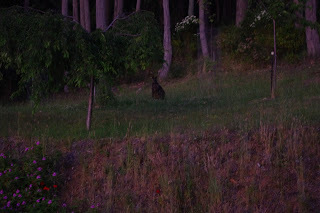 Fatso the wombat is a regular evening visitor to the farm. Fatso earned her name because she is one big wombat! She does have a visible bite mark on her bottom which looks suspiciously to me like the bite from another wombat and, well, to be polite about a rather delicate marsupial matter, wombat mating rituals are as rough as guts – if the sounds of that activity are any indicator. 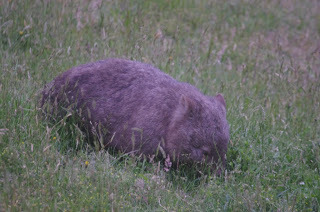 In the above photo Fatso the wombat was enjoying the feed so much the other night, that she simply plopped down in the paddock and started munching. Fatso is in a very good paddock as you can see in that photo and she can pick and choose from her choice of clover, pea, a couple of varieties of grass, and dandelions. What more could a wombat possibly ask for from any paddock? Fatso is not the defenceless little lady wombat that you may imagine. Her bottom and back has a very hard internal plate with which she can crush opponents and predators. If a fox was stupid enough to be cornered by a wombat in her burrow, then the fox may find itself crushed by the wombat against the wall or ceiling of the wombat burrow. 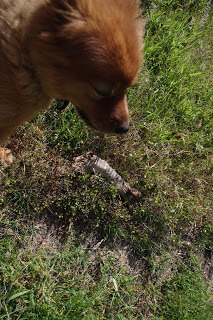 That would be a very unpleasant but almost certain ending for a fox. Wombats are like the armoured personnel carriers of the marsupial world! And apart from humans and their vehicles, wombats don’t have any natural predators. However, wombats are unlike Tribbles (a fictional alien from Star Trek that breeds like crazy in a frighteningly exponential manner!) because they are not in danger of taking over the planet (unlike Tribbles)! 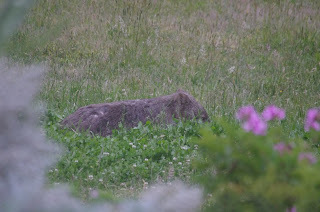 Wombats live in burrows in the forest, but they eat the grass and herbage which is to be found in paddocks and clearings in and around the forest. The wombat population is therefore limited by the availability of the food that the wombat population has easy access too. Fatso is a good looking wombat. But don’t be fooled by her charming behaviour and deceptively good looks. Fatso is one tough customer, because she has free access to the grass and herbage here whilst other lesser wombats are nervous in her presence. And Fatso in turn has to continually fight all of those other lesser wombats who want access to her feed. The feed is never constant in this part of the world because some years there are drought years and the pickings become very slim for the average wombat. 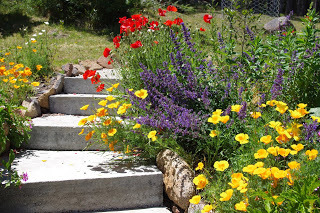 In drought years, the worm farm sewerage system, which processes the household’s waste water, produces the most reliable green grass and herbage in the area. And Fatso the wombat has sole wombat access to that reliable source of feed. 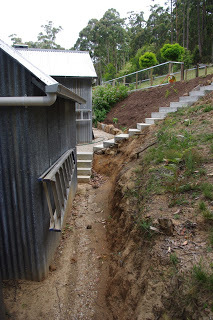 That access is a serious advantage for Fatso because drought years are normally very tough years for wombats. 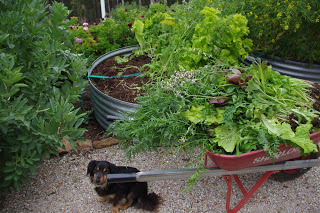 In those years, Fatso additionally has almost complete access to the garden and she can pick and choose whatever plants appeal to her taste buds. That wombat is no fool either, because Fatso the wombat knows that the garden beds and paddock have been fed with huge quantities of compost and so the plants that she does eat from those areas contain far more minerals than the equivalent plants in the surrounding forest or other clearings in the area. Yup, Fatso the wombat is nobody’s fool. 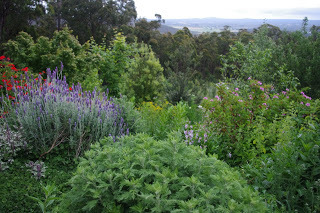 The paddocks, orchard and garden beds on the farm support more wildlife than just one huge wombat. 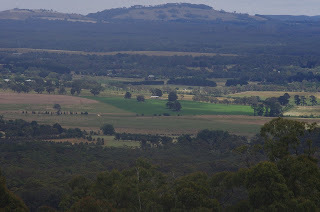 In fact, the paddocks support several wombats, a couple of wallabies, and some kangaroos. A decade ago those paddocks barely supported a single little wombat, let alone all of the life that now exists here at the farm. It has occurred to me over the past year or so that carrying capacity (the number of people, animals, or crops which a region can support without environmental degradation) is not a fixed concept. But by not being a fixed concept it is not implied that carrying capacity is unlimited. It may be that one day that I’m comfortable with and have made allowances for the deer to co-exist in the paddocks and orchards. However in previous years, the deer have not made a favourable impression on me, because they have consumed the bark of several apple trees which makes those trees more prone to disease and/or kills them. On this occasion, I was thankful for the services of Poopy the Pomeranian (who everyone knows is actually a Swedish Lapphund) and Sir Scruffy who worked together to chase the deer off into the depths of the forest. 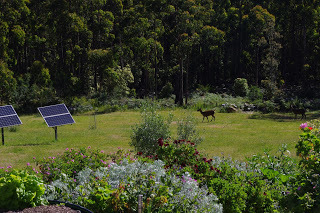 The difference between the deer and the wombats is that after many years, I understand what Fatso the wombat and her marsupial mates are capable of in the orchard and garden beds, whilst the deer are an unknown quantity. The day following the storm was quite cool and we decided to undertake a job that had not been done for years. 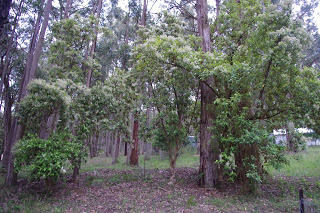 It has been many years since the local council mowed the sides of the road here and the road was in danger of turning into the forest. And on that road side there were more than twenty, but perhaps less than thirty old tree stumps (honestly, I lost count during the day and somehow managed to also burst a blood vessel in my eye I worked so hard). So in one day the editor and I mowed all 400m (about a quarter mile) of road sides and removed the old tree stumps. 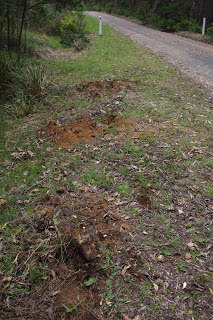 Chopping and dropping all of the overgrown vegetation along the side of the roads will provide more food for the local wombats! It is amazing what turns up in unexpected locations in the forest because in the process of that maintenance, we uncovered an old coke bottle and some very heavy duty car headlight glass, both of which were buried. 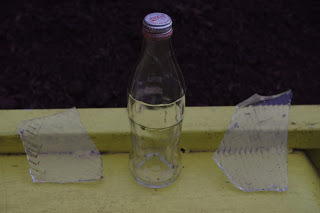 The coke bottle was old enough that the glass had begun to slump and run. Wombats are unable to eat glass! 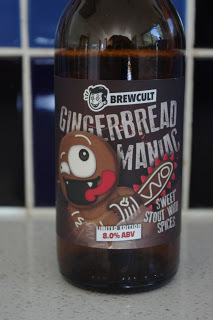 Speaking of glass bottles, we had dinner at the local pub last week and I happened to spot a most unusual and intriguing drink called: Gingerbread Maniac. Long time readers will note that I do not endorse products and/or services and I mention this bottle because the label caught my eye as it depicted a maniacal gingerbread dude wielding a gingerbread chainsaw. Who comes up with these ideas? 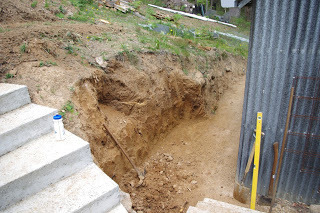 The outer layer of the house below the veranda had become slightly loose recently. 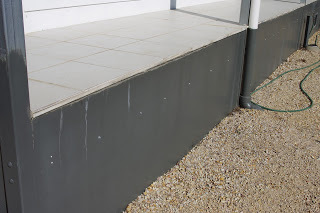 That outer layer acts as a fire rated wall and so it is sort of important to maintain! This week I used about 100 heavy duty hex head screws to anchor the outer layer of that fire rated wall to the frame of the house. 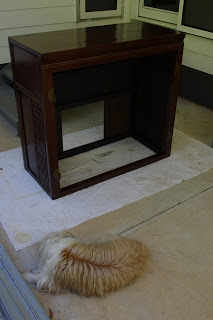 The replica antique Chinese cabinet which I reduced in size last week (not by using a gingerbread chainsaw!) has now had its doors reattached and the cabinet is sitting in pride of place in the living room. We have begun clearing the winter and spring vegetables from the many raised garden beds in preparation for planting with summer and autumn vegetables. The chickens have had a massive feed of these many vegetables. The seeds for those summer and autumn vegetables were planted today. 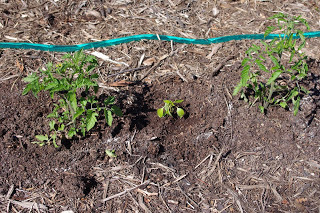 The spare ground in the tomato enclosure was planted out with capsicum (pepper), eggplant, and melons today too. The many tomato seedlings planted over the past week or so have all survived. 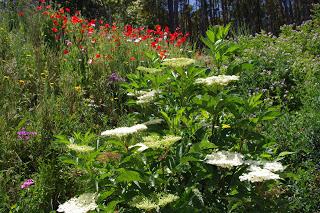 The large and ancient daisy bushes (Musk Daisy Bush – Olearia Argophylla) which form part of the forest understory have recently begun to produce flowers. They’re quite impressive. 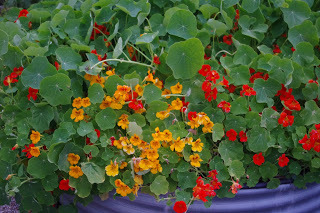 The nasturtiums which I grow in a permanent bed have also begun to flower over the past fortnight. 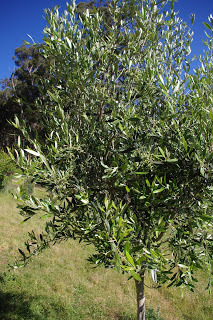 The entire plant is edible and they thrive in the sort of extreme UV and hot conditions that is a normal summer here. 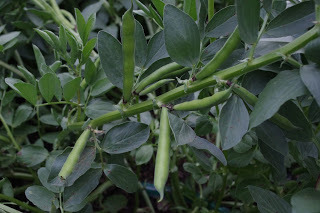 Broad beans are also producing huge quantities of pods this week. Some of the seeds in those pods will be dried for replanting next season. 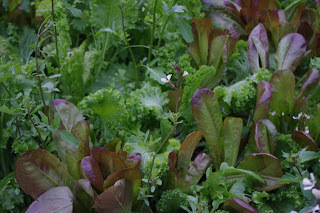 There is still a huge quantity of salad greens to pick from! 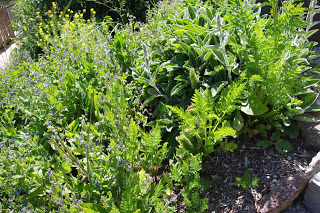 At this time of year, if you watched them long enough, you can almost see the many herbs growing and the herb garden looks feral / delightful. 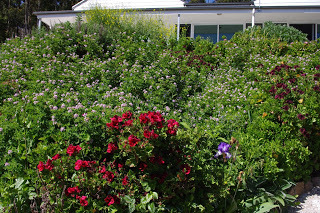 The flower beds around the courtyard are attracting enormous quantities of bees and on a sunny day, you can hear the buzzing as the many bees harvest pollen and nectar. 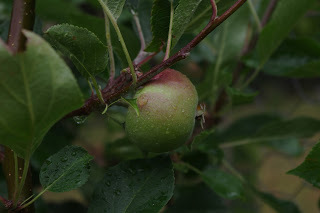 Apples are starting to slowly swell and gain size on the many apple trees here. 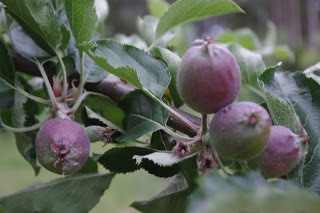 I’ve forgotten exactly how many apple trees there are, but I do recall that there are at least 26 different varieties. 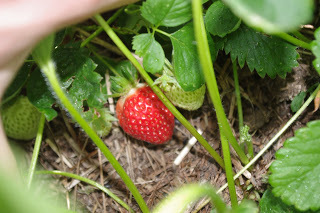 But this week, the strawberry patch is producing a handful of ripe strawberry fruit every day. Fatso the wombat says: Stay! The temperature outside now at about 7.45pm is 26’C (79’F). So far this year there has been 1,180.6mm (46.5 inches) which is the same as last week’s total of 1,142.0mm (45.0 inches). Magical Christmas Unicorns really do exist! Seriously, I met one last Thursday evening. It was a real pleasure to meet a real live Magical Christmas Unicorn, but unfortunately for me the pleasure was short lived. You see the editor also met the (actually I should have written: my) Magical Christmas Unicorn and in a gallant display of gentlemanliness I introduced the Magical Christmas Unicorn to the editor, and that was that because my Magical Christmas Unicorn was then gone. Alas for me! The local pub up here in the mountain range is a delightful business establishment. The quality of the food is good and the pub serves locally sourced beers, ciders, and wines. What more could you ask for? About once per fortnight the editor and I will visit that pub and enjoy an excellent meal and sample a random local brew. It is always a mystery to me as to what locally brewed beers will be on tap and the editor prefers the local apple ciders. The pub has a lovely atmosphere and occasionally we even say hello to some of the other locals who we are acquainted with. The building of the pub looks to me as if it was constructed in the 1930’s and indeed, consulting my local history books, I note that the original timber building was the “Oriental Hotel” which was destroyed by a kitchen fire in 1931. The clinker brick building that I see today which is known as the “Mountain Inn” was built on the ashes of that much older Oriental Hotel. The interior is very charming with furniture and finishes dating from that Depression era and there are even pressed metal ceilings. Best of all it doesn’t have multiple huge television screens on every wall glaring down on us and interrupting the natural flow of the conversation between the editor and myself. And that conversation covers a lot of ground including: Magical Christmas Unicorns! During the course of the previous Thursday night at the pub, the editor casually observed that in recent times we had moved to visiting the pub on weeknights rather than weekends. This was a fascinating observation which was the result of the much larger crowds at the pub on the weekends and our dislike of the busier atmosphere. Both the editor and I are accountants and of course we realise that crowds make for profitable weekends, however, regular locals keep food and drink establishments operating and covering their costs during the long cold winters. Honestly, adding vanilla to pale ale to produce a Magical Christmas Unicorn is pure genius. The beer tastes like creamy soda! And the demented deer/unicorn with a curiously dripping ice cream on its head only adds to the intrigue and mystery of the brew. The other day out of sheerest curiosity I went to the brewer’s website and witnessed sad tales of lament from many sad – and fortunately not local people – about the lack of supply of this magical ale. Alas for me, I understood their sad tales all too well because I had to witness the editor consume this most delightful of beverages whilst I was handed her local apple cider. 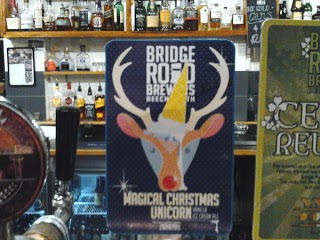 It was a good apple cider and a gentlemanly swap, but it wasn’t a Magical Christmas Unicorn was it? Later as the cider / unicornless haze lifted, I recalled that I had recently received a flyer in my local Post Office box calling for local attendance at a meeting to discuss how to deal with the massive influx of tourists who descend upon the mountain range each weekend in autumn to see for themselves the magic of the colours of the leaf change. Leaf change is when the deciduous trees turn from green to their autumn reds, yellows and oranges. The organisers of that meeting must have had some political clout because a representative from the local council, the police, and even the states roads body were to be present. The leaf change is a spectacular thing to see, however I don’t travel to that more fashionable end of the mountain range during those weekends because it is feral busy. So many people in clean city vehicles driving up the main road in that more fashionable part of the mountain range, causing grid lock. There are so few parking spaces that I have seen more than a few vehicles which have attempted to park next to the very large drains along the sides of the roads, and have unfortunately driven / fallen into them. Alright I confess to a small amount of Schadenfreude whenever I see that unfortunate turn of events, and to be totally honest I do wonder how those stricken vehicles were eventually extracted from the rather deep drains! It is an impressive recovery feat, I mean it’s not like recovering articles from the Titanic sitting at the bottom of the ocean depths, but still, those stricken vehicles were on some remarkable and intriguing angles! I wonder if it has occurred to the people who organised that community meeting that what they were seeing with all of the leaf change tourists was Population Pressure in this usually very quiet and very unpopulated mountain range. Population Pressure is defined as “the frequency of mutual interference per capita per day resulting from the presence of others in a finite habitat”. That is a fancy way of asking the hard question as to how many people annoyed you today? And clearly in a small mountain range, an unusually huge quantity of people, who are not very skilled at driving and parking in the country, are annoying the local residents. And I wondered to myself just how many people have annoyed you – the reader – today? 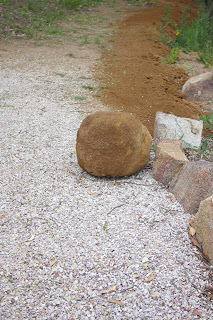 In the process of those excavations we removed a huge rock, which we were able to (barely) roll out of the way. Observant readers will see that in the next photo below all of the excavated soil has been used to construct a ramp leading down off this terrace and into the orchard. 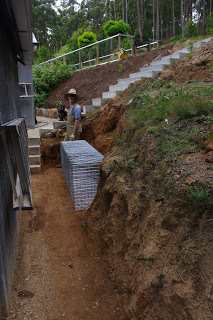 Later that day – after a good lunch of course – the construction of the steel Rock Gabion cage was commenced. 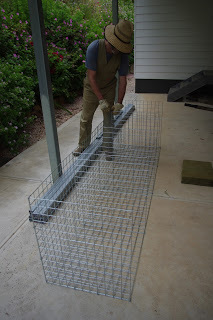 A Rock Gabion cage is basically a square steel wire cage which is used to hold rocks. As the wire cage is square and contains rocks, it becomes enormously strong. Once the Rock Gabion was completed, it was then placed next to the excavated area and it now only requires to be filled with rocks. Unfortunately, we have long since passed peak rocks and so will have to travel a bit further afield to collect enough rocks to fill that wire cage. And don’t fear, another Rock Gabion will be placed on top of this Rock Gabion once it is completely filled with rocks. 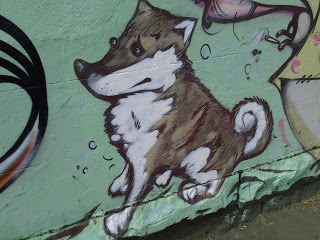 Is this street art Poopy the Pomeranian? Poopy the Pomeranian has made a huge strike for the Resistance this week as he continued the ongoing canine Bone Wars (TM) by bringing back a dead kangaroo paw to chew on. 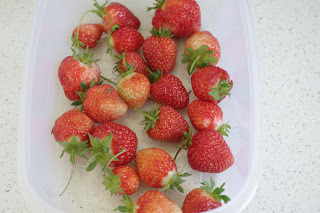 It is still early days in the berry season here, but the strawberries which are planted in – less than fluffy optimal conditions – are producing larger quantities of sun ripened berries this week. 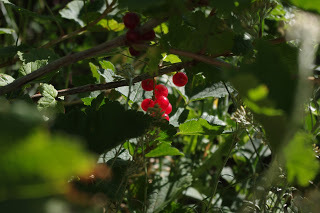 Other berries are starting to become ripe this week and I noticed that the red currants looked delicious on the shrubs today. 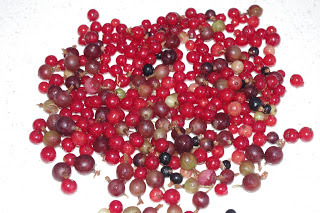 Most of the black and red currants here get converted into wine – and it is an excellent tasting wine. 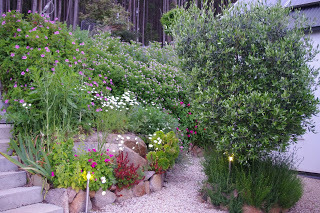 The potatoes are going feral and are just about to start producing flowers. 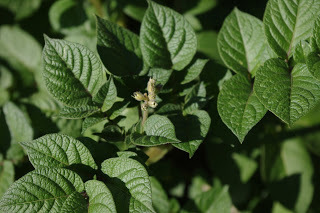 As a potato plant produces flowers, you know that they are beginning to produce yummy tubers in the soil. As a general rule, the potato tubers are ready to dig up at the end of the season, two weeks after the plant has turned yellow and died. 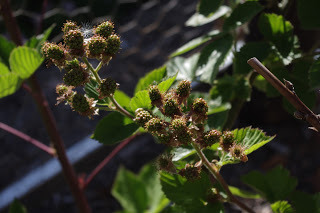 I spotted the first unripe raspberry a couple of days ago. I have never before successfully grown raspberries so I’ll be really interested to see what the fruit tastes like. The blackberries are also producing huge quantities of not yet ripe berries. The berry bed has been so successful that there are plans afoot over the winter to extend the recently completed berry enclosure! 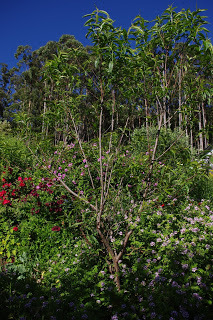 The very wet and cold winter and spring has decimated the apricot, plum, cherry and pretty much all other stone fruit in this corner of the world. I tried to source a good quantity of apricots from another orchard much further north than here (and thus in a warmer climate) but they too have had to deal with serious losses of fruit. Over the past few days I have reconciled myself with not being able to preserve any stone fruit at all this season. And some trees such as the sugar maple in the next photo below, really love the very wet and cold conditions this spring. 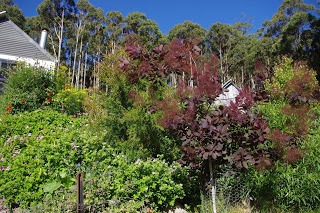 Those trees have responded by putting on huge amounts of growth. 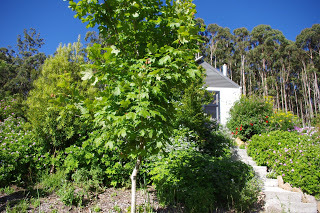 A sugar maple tree can generally be tapped for proper maple syrup after about 10 years of growth. The temperature outside now at about 8.00pm is 22’C (72’F). So far this year there has been 1,181.2mm (46.5 inches) which is more than last week’s total of 1,180.6mm (46.5 inches). Christmas in Australia is a weird experience. Shorts, t-shirts and sandals were the way to go yesterday, as Melbourne experienced its hottest Christmas day in 18 years of records. But spare a thought for the people living in the city of Adelaide (which is in the state to the west of this state of Victoria), who experienced their hottest Christmas day in 70 years of records. Far out it was hot yesterday! 36.3 degrees Celsius (100’F) in Melbourne is a hot Christmas day in anybody’s language! And I reckon it is important to recall that 18 years ago the official weather station for Melbourne sat on a corner of a busy intersection just on the edge of the Melbourne CBD. 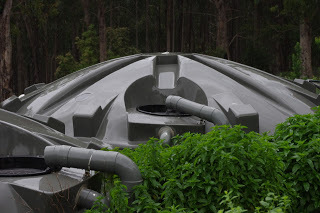 I use the past tense to describe that weather station because a year or so ago – and in these more enlightened times – that weather station was moved into parklands along the banks of the Yarra River. Since that weather station was moved to a cooler location, I have cynically felt that the current weather records are akin to describing the differences between apples and oranges. Yes, they are both fruit, but it would be a very big call to describe them as tasting the same. The editor and I were lucky enough to spend Christmas day in the company of friends, dining in the shade of century old walnut trees. It was a very lovely Christmas day and everyone enjoyed a very long lunch extending into an even longer dinner whilst the hot Christmas day sun fell below the horizon. 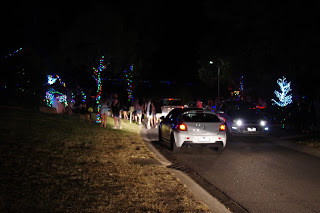 On Christmas Eve, the editor and I had decided – for research purposes for this blog, of course – to check out the nearby town where some householders had decided to adorn their streetscapes with massively huge quantities of Christmas lights. The night was warm and we arrived to find that the street was absolutely feral with people. 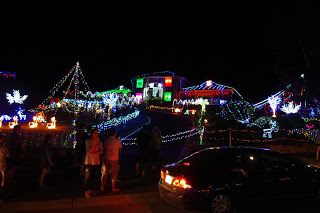 It was great to see so many people enjoying the light display that the householders had installed. Some of the houses in that street installed a fantastic display of lights for the public and we really do enjoy their efforts. 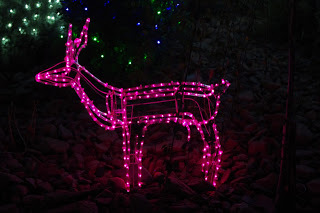 I won’t even mention that the Christmas light in that particular installation is a tasteful shade of pink! Whatever was the manufacturer thinking? The majority of this week was hot, so spare a thought for us as summer has barely started. Two of the dogs here at the farm have very long and thick coats and so this week, both of those dogs have lost a considerable amount of hair, as well as mojo. 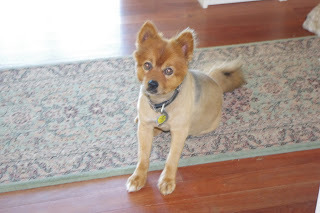 All thinking people know that if anyone or anything ever gets their hair cut, then they will lose mojo. In an unfortunate, but alas necessary hair intervention (edit: including eyebrows and nostrils), I also lost mojo this week! What’s going on? 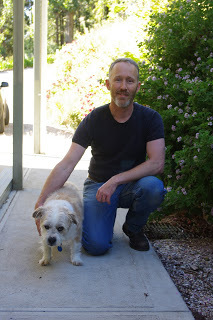 Anyway, unlike Sir Scruffy who looked very surly and unsure of his remaining mojo after being groomed this week, I looked reasonably happy about it! Who doesn’t love freshly baked bread? I do, but baking a loaf of bread in a hot oven inside a house during hot weather is a very silly idea. In hot weather we simply bake fresh bread in a dodgy old electric (solar powered) oven that is on a stainless steel bench outside of the house but located in the shade. Unfortunately, the front glass door of that dodgy old electric oven broke late last summer and no longer closed. 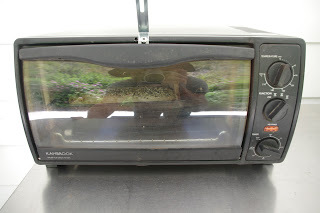 This is a bad problem because if the door to the oven does not close properly, then all of the heat which is generated gets lost to the atmosphere – which could be said doesn’t actually require any additional heating – and the bread does not bake properly. Anyway, this week, I installed a piece of steel which holds the glass door of the oven firmly closed. That piece of steel can be easily slid up to open the door, and then slide back down again to lock the door firmly into place. I can now bake fresh bread outside again on hot days without heating up the inside of the house! As far as I am aware, that paddock has not received any additional watering. 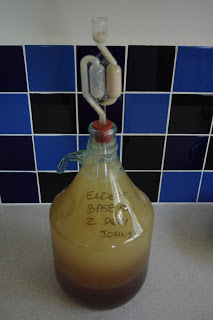 Observant readers will note just how much muck makes its way through the plastic airlock on the top of the demijohn during the first few days of the fermentation process. 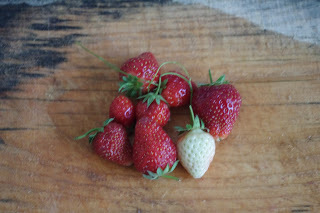 A few months ago we planted a variety of strawberry plants that promised white strawberries, and we got a white strawberry this week. Nuff said really. They taste like strawberries to me so I’m not sure what all the fuss was about. 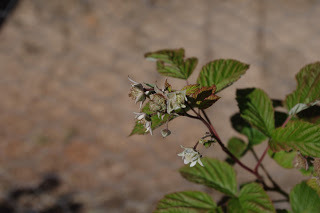 On the other hand, the many raspberry canes produced the first raspberry. This berry is the first raspberry that we have ever successfully managed to grow, and it was superb tasting! 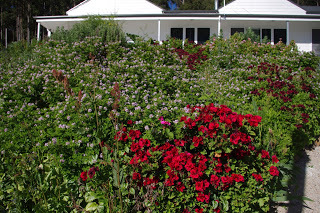 We have not watered those raspberry plants either and so the raspberry flavour was very sharp. 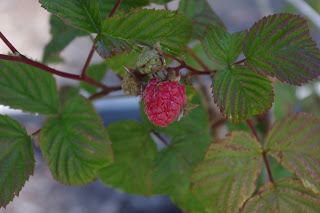 Commercial raspberries are usually over watered and picked underipe and so taste like cardboard.We’re looking forward to more raspberries over the next few weeks. The newly completed berry enclosure is looking very good, but could obviously use a year or two’s extra growth. 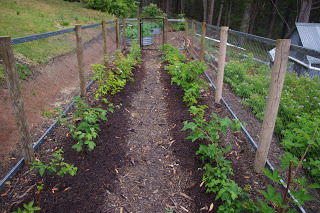 Over winter we have plans to extend this berry enclosure. 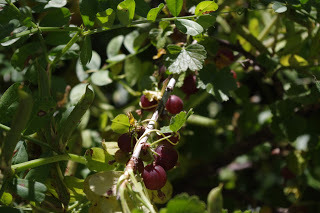 Speaking of berries, the jostaberries, gooseberries, black and red currants began producing edible fruit this week. Yum! 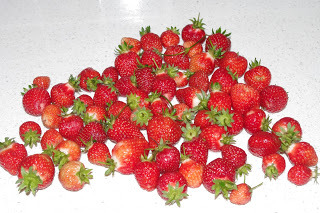 A couple of minutes of picking produced a good quantity of ripe and very yummy berries from various garden beds. All of those berry plants are so easy to reproduce too. In late autumn, I take cuttings from the existing berry plants and then poke those cuttings into fertile ground. 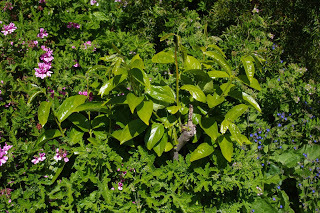 By spring you will note that the cuttings are producing new leaves, and by the following year you should be seeing ripe berries. 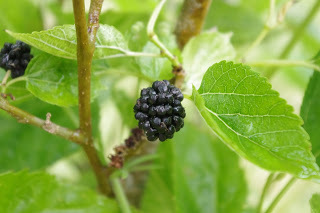 The mulberry trees looked very sickly earlier this season due to the cold and very wet spring, but once the sun began shining with some serious force, the mulberry trees perked up and produced lots of fruit. Mulberries are delicious and the first of them are only now just becoming ripe and ready to eat. 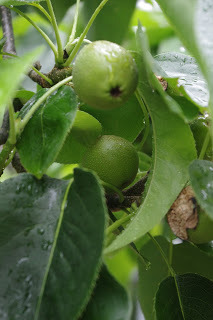 The Asian Nashi pears have really put on some size this week. Observant readers will note that in the photo below the local parrots have already begun sampling them and if I’m not quick, the birds will consume them all! 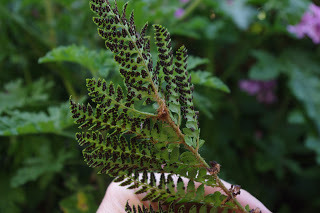 Mother shield ferns are a local variety of fern and I noticed massive quantities of spores on the underside of their leaves earlier in the week. These ferns are very sun and heat hardy and they look great en masse. Stumpy the wallaby looks innocent, but he is a formidable opponent to unsuspecting fruit trees. 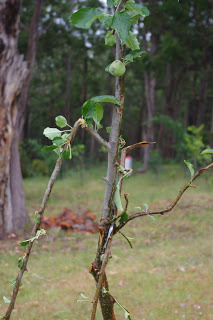 The apple tree in the next photo shows the sorts of damage that wallabies do to the lower branches of fruit trees in an orchard. 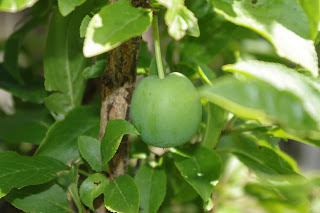 It is a fair thing to say that there are few if any lower branches on the many fruit trees in the orchards here! 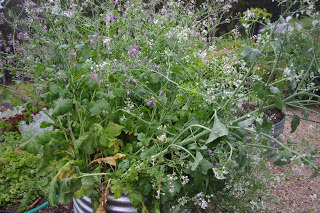 My experiments with growing radishes, beets and turnips are yielding a huge quantity of seeds for next year. As each type of seed is collected, I’ll remove the plant from the soil in order to determine what type of root vegetable that the seeds belong too. Whilst at my favourite café in Melbourne the other day, I happened to notice that they had bags of coffee grounds and also bags of the husks from the coffee bean roasting process. I asked if they were throwing the bags out, and apparently they give them away free to customers. 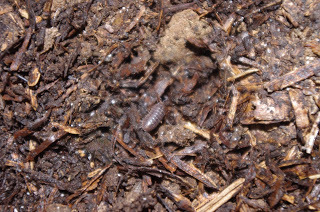 So I said that I’d happily take any and all of the organic matter that they could spare! Best Christmas present ever: free organic matter! 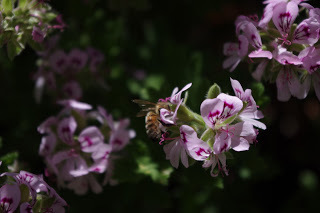 With the hot weather this week, the farm is jumping with insect life all of which are harvesting the vast quantities of pollen and nectar from all of the flowers. 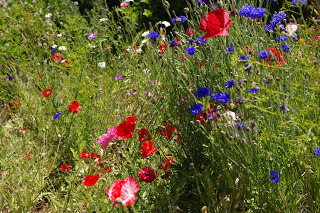 Other insects are however more pragmatically feasting on the these unsuspecting pollen and nectar harvesting species! It is interesting to see that the European honey bees that live in the feral colonies in the nearby forest are much larger and have more diverse body shapes than the European honey bees in my hive. 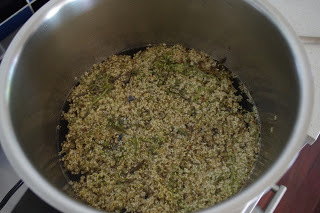 I’ve read that this situation arises because the European honey bees in the feral hives draw out their own wax and are thus able to produce cell shapes and sizes in that wax to suit their own preferences. This then determines the size and shape of the bees. And just to prove how strange the weather can be down here. The rest of the week will be very hot, and very humid, whilst this afternoon on Boxing Day a cool change / storm rolled through with an excellent Christmas gift of 3.5mm (0.14 inches) rain.